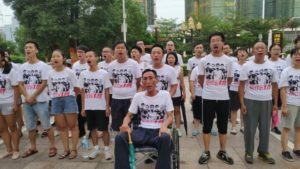 On July 27, 2018, police arrested thirty protesters in Shenzhen, including 29 Jasic Technology workers and a university student. Shen Mengyu, the recent graduate who stood in solidarity with the protesting workers, has since been completely cut off from communications. More recently, the clampdown on Dagongzhe Zhongxin, literally translated as Migrant Workers’ Center, whose staff-in-charge was allegedly linked to the Jasic protest, was apparently intended as a warning to other activists that they have gone too far in their interventions.1 According to state media, the fundamental conflict was caused by the “illegal, violent actions” of dismissed Jasic workers2 and the instigation of an “unregistered illegal organization.”3 Contrary to these claims, this article argues that the central problem was the blatant violations of workers’ rights and interests by both the Jasic employer and the Chinese government, including the country’s only official trade union organization, the All-China Federation of Trade Unions (ACFTU). Earlier this May, several Jasic workers reported to a labor bureau the company’s arbitrary imposition of punitive fines and irregular work shifts, as well as underpayment of the housing fund.4 Some were advised by district-level trade union officials to safeguard themselves in accordance with the law. Under the Chinese Trade Union Law, all types of enterprises with 25 employees or more are supposed to have “basic-level trade union committees” on the shop floors (Article 10). An enterprise union shall be approved by the next higher level trade union (Article 11). Jasic Technology Company, founded in 2005 and listed on the Shenzhen Stock Exchange in 2011, is widely known as a specialist in the welding industry and one of the top 500 enterprises in Guangdong.9 Less known is that Jasic had failed to set up a trade union since its opening 13 years ago. Evidence shows that Jasic management has long evaded its responsibility to facilitate workers to participate in collective consultation over work and employment issues such as wages, working hours, health and safety, and welfare benefits for both male and female employees. Not until this May did the company claim that it has begun to “establish a union in an orderly fashion.” Obviously, the corporate move was a strategic response to unprecedented labor challenges from the bottom up. Jasic worker leaders, with trust and confidence from co-workers, had quickly gathered 89 signatures out of a factory workforce of 1,000 for the union membership application. At this point, the authorities withdrew their original “verbal support” for workers’ unionizing. Instead, they recognized only the efforts of management, who likewise submitted their intent to “set up a union in accordance with the law.” The relationship between Jasic management and the government cannot be closer, as revealed in this fierce worker-led struggle for union rights at the factory level. By early August, Jasic had taken full control over union organizing by crushing the workers’ initiatives. Candidates nominated by the workers were all excluded from the newly formed company union. In Jasic and other workplaces, bargaining through workers’ direct actions, such as collective protests and strikes, has always been risky and dangerous even when it is a viable way to address workers’ shared grievances under despotic management and inadequate legal protection. In this case, workers did not win any concessions over wages and welfare benefits. Worse, the worker organizers were accused of “illegally unionizing,” assaulted by company security officers and local police, and fired. Yu Juncong, Liu Penghua, Mi Jiuping, and Li Zhan were charged with the crime of “gathering a crowd to disturb social order.” Their family members, and the lawyer who represents them, have been repeatedly harassed and threatened. Tim Pringle, in assessing the future of Chinese union reforms in light of growing labor unrest, stresses the need not only for “more accountable enterprise-level union chairpersons and committees,” but also “more supportive, interactive, and, at times, directive relationships between the higher trade unions and their enterprise-level subordinates.”10 Conspicuous by his absence, the Beijing-based ACFTU chairperson, Wang Dongming, in effect endorsed discrimination and retaliation by Jasic against its employees, particularly those who had fought for setting up a representative union. As China’s officials make extensive use of their discretionary power to resolve major labor crises rather than enabling workers to exercise fundamental rights to freedom of association, it is unclear how long this government-led strategy will remain viable, particularly when workers’ basic rights and interests are routinely violated. During the late nineteenth and early twentieth centuries, students and intellectuals played a critical role in the nascent labor movement of China’s modern history. Today, in a deeply marketized economy under the auspices of the party-state, university students and workers involved in the Jasic incident similarly show a heightened sense of social awareness. In service learning and participatory social research projects, more and more university students have entered the lives of low-paid campus cleaners and canteen workers, construction laborers and coal miners with fatal pneumoconiosis, evicted peasants losing their homes and land, and rural migrant workers living at the city margins. Some have chosen to work on the assembly line to gain a better understanding about the transnational labor process behind the production of the iPhone.17 The others have joined hands to launch a #MeToo-style blog to share stories of sexual harassment and other forms of gender violence at the university and in the larger society. Despite diverse socio-economic backgrounds, the student organizers have come together to rethink the sources of durable inequality and injustice. They aspire to have equality, love, and freedom. They read and debate the classical works of Karl Marx, Vladimir Lenin, Mao Zedong, and Lu Xun, among many others. In the wake of the July 27 worker crackdown, the multi-university Jasic Worker Support Group addressed the authorities by making an open call, grabbing the headlines of local and international news: “Return to us our comrades; return to us our workers!” Students posted blogs, photos, videos, and big-character letters to mobilize urgent support for the release of protesting workers and fellow classmates. On August 24, in Huizhou City adjacent to Shenzhen, the riot police raided a rental apartment and arrested about 50 Jasic-worker supporters, including students and workers. Yue Xin, 22, a fresh graduate of Peking University who majored in foreign languages, was forcibly disappeared after the raid. No news about her whereabouts is available to date. Li Tong, a final-year undergraduate and a member of the Marxist Society at Nanjing University, has been placed under house arrest. Thus far, supporters including Gu Jiayue (Peking University graduate), Zhang Shengye (Peking University graduate), Wu Jiawei (Renmin University graduate), Xu Zhongliang (University of Science and Technology Beijing graduate), Yang Shaoqiang (University of Science and Technology Beijing graduate), and a few unnamed ones, were either detained or placed under house arrest by the “comprehensive social management teams” directed by the authorities at different levels. Students who were “set free” testified that they had been threatened with investigation and disciplinary action if they did not withdraw from the action. Their freedom, including the use of the Chinese messaging app WeChat and other communication tools, was significantly restricted. Qimin Xueshe, a six-year-old Marxist study group at the University of Science and Technology Beijing, was on the verge of being closed permanently on October 12. Student activists were pressured by the university party committee to stop making any further efforts at mobilization. The outcome will not be a deadly silence, however. A student organizer pledged that “the body” of his organization could be crushed by de-registration in the hands of the university bureaucrats under the newly amended “Student Society Management Rules.” But “the spirit” of pursuing social justice will not die. He clenched his fists, showing great determination to carry on the fight. “Realize the great Chinese Dream, build a harmonious society,” intones a government banner. The definition of that dream and the determination of who may claim it remain contested. The evolving consciousness and praxis of the Chinese workers, with growing support of students, academics, and labor rights activists at home and abroad, is pivotal to charting the future of China in the globalizing economy. Without effective union leadership, workers from Jasic and other companies are impelled to rely overwhelmingly on their own efforts to fight for economic compensation and benefits, many of them stipulated in the law. Discrepancies are huge between the rights promised on the books and those delivered. Labor challenges, including notably the rebuilding and revitalization of grassroots trade unions, will inevitably confront a tactical mix of reconciliation and repression on all fronts, resulting in uncertainty and instability. Dagongzhe Zhongxin, or Migrant Workers’ Center, has provided free legal services and other support to Chinese migrant workers in Shenzhen industrial towns since 2000. The center has long collaborated with Worker Empowerment, a Hong Kong non-governmental labor rights group. See “Statement from Worker Empowerment,” Aug. 27, 2018. Also see the joint statement of Shenzhen Dagongzhe Workers’ Center and Worker Empowerment entitled “Release Fu Changguo Now!” September 13, 2018. For further discussions, see Tim Pringle and Anita Chan, “China’s Labour Relations Have Entered a Dangerous New Phase, as Shown by Attacks on Jasic Workers and Activists,” South China Morning Post, Sept. 19, 2018; Elaine Hui and Eli Friedman, “The Communist Party vs. China’s Labor Laws,” Jacobin, Oct. 2, 2018; a series of articles on “The Jasic Workers’ Struggle in China” at Labor Notes (starting from Nov. 5, 2018). Xinhua, “Investigation on So-called Worker Incidents in Shenzhen,” Aug. 25, 2018. Zhao Yusha, “Chinese Workers Warned Against Foreign-funded Advocacy Groups,” Global Times, Aug. 26, 2018. According to China’s Social Insurance Law, effective July 1, 2011, employees are legally entitled to five types of insurance (medical insurance, work-injury insurance, old age pensions, maternity insurance, and unemployment insurance) and a housing fund (designed to ensure that workers save to purchase housing). All-China Federation of Trade Unions, “ACFTU Marks 80th Anniversary,” 2005, print edition. Zhan Lisheng, “Guangzhou: Hotbed for Rise of Trade Unions,” China Daily, Aug. 29, 2006. Mingwei Liu, “‘Where There Are Workers, There Should Be Trade Unions’: Union Organizing in the Era of Growing Informal Employment,” in Sarosh Kuruvilla, Ching Kwan Lee, and Mary E. Gallagher, eds., From Iron Rice Bowl to Informalization: Markets, Workers, and the State in a Changing China (Ithaca, NY: Cornell University Press, 2011), 157; Jenny Chan, Ngai Pun, and Mark Selden, “Chinese Labor Protest and Trade Unions,” in Richard Maxwell, ed., The Routledge Companion to Labor and Media (Routledge, 2016), 290-302; Anita Chan, ed., Walmart in China (Ithaca, NY: Cornell University Press, 2011). “Number of Grassroots Trade Unions by Region (2016)” and “Trade Union Members in Grassroots Trade Unions by Region (2016),” China Labour Statistical Yearbook 2017, 410-13. “Jasic Technology’s corporate history (2005-present),” Jasic Technology. Tim Pringle, Trade Unions in China: The Challenge of Labour Unrest (Abingdon, Oxon: Routledge, 2011), 162. See, for example, Ching Kwan Lee, Against the Law: Labor Protests in China’s Rustbelt and Sunbelt (Berkeley: University of California Press, 2007); Yang Su and Xin He, “Street as Courtroom: State Accommodation of Labor Protest in South China,” Law and Society Review (Vol. 44, Issue 1, 2010), 157-84; Xi Chen, Social Protest and Contentious Authoritarianism in China (New York: Cambridge University Press, 2012); Yanhua Deng and Kevin J. O’Brien, “Relational Repression in China: Using Social Ties to Demobilize Protesters,” The China Quarterly (Vol. 215, Sept. 2013), 533-52; Benjamin L. Liebman, “Legal Reform: China’s Law-stability Paradox,” Daedalus: The Journal of the American Academy of Arts and Sciences (Vol. 143, Issue 2, 2014), 96-109. Chris King-chi Chan and Elaine Sio-ieng Hui, “The Development of Collective Bargaining in China: From ‘Collective Bargaining by Riot’ to ‘Party State-led Wage Bargaining,’” The China Quarterly (Vol. 217, 2014), 221-42; Dave Lyddon, Xuebing Cao, Quan Meng, and Jun Lu, “A Strike of ‘Unorganized’ Workers in a Chinese Car Factory: The Nanhai Honda Events of 2010,” Industrial Relations Journal (Vol. 46, Issue 2, 2015), 134-52. Ching Kwan Lee and Yonghong Zhang, “The Power of Instability: Unraveling the Microfoundations of Bargained Authoritarianism in China,” American Journal of Sociology (Vol. 118, Issue 6, 2013), 1486. Feng Chen and Xin Xu, “‘Active Judiciary’: Judicial Dismantling of Workers’ Collective Action in China,” The China Journal (Vol. 67, 2012), 87-107; Mary E. Gallagher, Authoritarian Legality in China: Law, Workers, and the State (New York: Cambridge University Press, 2017). “Scholars Demand the Shenzhen Government Release Jasic Workers Arrested for Attempting to Unionize,” RC44 – Research Committee on Labour Movements. “Global Call on China to Release Arrested Workers, Activists, and Students in Jasic Struggle,” Action Network, September 2018. Ngai Pun, Yuan Shen, Yuhua Guo, Huilin Lu, Jenny Chan, and Mark Selden, “Worker-intellectual Unity: Trans-Border Sociological Intervention in Foxconn,” Current Sociology (Vol. 62, Issue 2, 2014), 209-22. Jenny Chan, “Shenzhen Jasic Technology: The Birth of a Worker-student Coalition in China?” Hong Kong Free Press, Sept. 1, 2018. Elizabeth Redden, “Cutting Ties,” Inside Higher Ed, Oct. 29, 2018. Jenny Chan is an assistant professor of sociology at The Hong Kong Polytechnic University and vice president of communications at the International Sociological Association’s Research Committee on Labor Movements. She also serves as an academic advisor of Hong Kong-based Students & Scholars Against Corporate Misbehavior. The author thanks New Politics editorial board members Nancy Holmstrom and Lois Weiner, along with Richard Smith, for their warm encouragement and solidarity support in the writing process.